The garden has been neglected. Having builders around has meant that not only have I not grown things, but also I have not been doing all the day-to-day maintenance. As a result the fruit cage has turned into a jungle with head-high docks and mint, plus nettles and brambles starting to take over some patches. However, now I have the garden to myself and a bit of decent weather, I’ve started making in-roads into the chaos. I’m far too ashamed to show a picture of the full horror of it, but there are hidden treasures. Despite being overshadowed by a large comfrey plant, this particular red currant bush had the biggest juiciest fruit you can imagine. I think I might make red currant and white chocolate muffins for breakfast tomorrow. And elsewhere, the raspberries are doing well – not quite as pretty as the red currants, but I like the flavour better. Some of these will be frozen for later use, but most mornings I have a handful on my granola… best when still warm straight out of the garden. Are you harvesting at the moment? Looking delicious. Broad beans in abundance here, eaten whole as a vegetarian stew. Yesterday I juiced a whole basket of mandarins from our tree and froze the juice in small containers. I’m having to fight the birds and insects for tomatoes, and it’s been so wet and cold (OK, cold for us…) that the zucchini have succumbed to sooty mould. On the upside, the lime tree is putting out a whole shock of new blossom, so there’ll be more limes soon, and both types of tropical spinach are thriving. How lovely that you have such a productive garden now… and what a change from your former back yard! I do love being able to walk out of the back door and pick something… I must say, of all the growing things, the fruit trees are my favourite – especially the lime, which goes on giving almost forever. The mandarin is wonderful but is far more seasonal. And my mature mango trees are in flower – hopefully the cold front which is currently sweeping north will not retard them and we might actually get some fruit! I feel a gardens of Chiconia post coming on! Good grief, though. The weather in SE Australia has even made it onto the main BBC news web page… I really hope the cold air stays away from your precious mango flowers. It’s a bit unbelievable, isn’t it? So much for climate change being a fiction, eh? We have places where there’s been no rain for over 6 years, snow in the sub-tropics, hard frosts inland even in the tropics, dry Wet seasons and wet Dry seasons. The only good thing about this cold weather is that the cane farmers are rejoicing; after a dismally dry Wet and rain coming too late, the cane sugar content is now rising fast due to the cold, so the entire season’s crop will not be a total loss… Compared with the loss of livelihood of the cattle farmers and cane farmers up here, I don’t feel the loss of a few mangoes! I’m harvesting lots of greens….lettuce of all varieties, bok choy, chard and silver beet, have enjoyed a couple of cabbages, and I noticed last night there are purple beans ready to be picked, they’ll be tonight’s dinner. Lots of tomatoes too. Also plenty of citrus from around the neighbourhood, people don’t pick the fruit at all, just lett it fall and rot, that’s if the bats don’t get it first. So I’ve been a-gleaning, making jam and gifting back jars of lovely tangy marmalade. I’d love to grow currants and raspberries, but it would be a short season…sub-tropics…..there are low-chill varieties but I don’t have room for them ..at the moment. I did have greens, but they got covered in cement dust and that did for them. I do have some peas flowering now… plus lots and lots of potatoes. I do envy your access to citrus fruits. I’m always sad to see fruit falling from trees unused… it is so common 😦 Good to know, however, that some of us try to make use of it. No! But yours look delightful despite the enforced neglect! 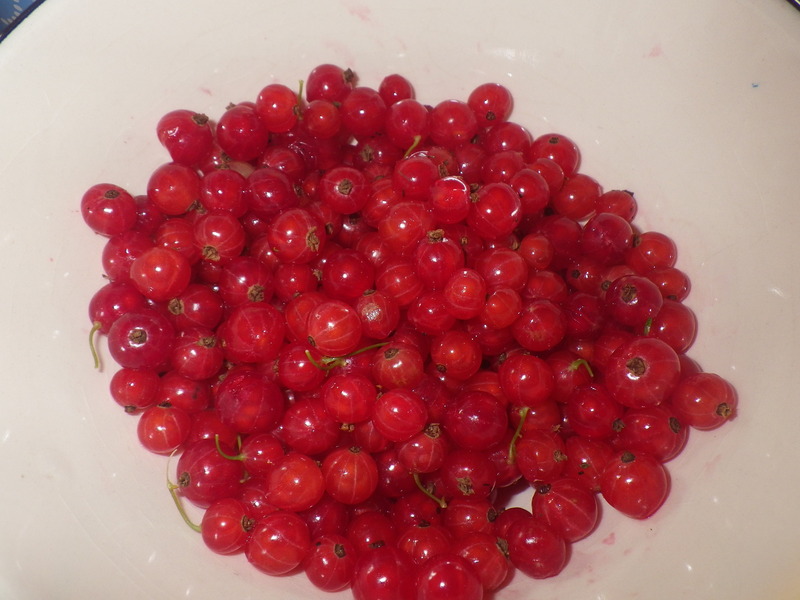 I do love the look of red currants… and it was such a joy to find them hidden in the rampant growth. I bet you are looking forward to spring – it sounds like your winter has been dreadful. Minus 11 C last night – this is Arctic Tundra weather. We do not have the houses or clothing for this kind of carry on!! I hope it’s all over soon and warmer weather heads your way. In the mean time try to keep warm and work on more blankets! Those currants are gorgeous! I have never seen those in the wild or grown them. They are lovely – tart and tasty. so good with rich things, like cheesecake and an excellent substitute for cranberries. This spring iAds a change to my plan, changing from ‘things I would like to be able to grow’ to ‘things I know everyone will devour’ so now we are all eating fresh salad every day, today little gem, oak leaf, chard, rocket, spinach, cucumber and peas. The lettuce has been producing salad everyday since the end of May, and is going strong. I have some great big bro ills plants in pots waiting to take their place for later on, I am learning to hone my garden to the people I want to feed, and put my vegetable ego on the side! You are right… since I started growing potatoes we have made use of every singe one of them… and I never have to ponder what I might be able to use them for. Plus, once you start growing them, you can never get rid of them – currently we are eating ‘volunteers’ from last year’s potato bed! I wish my salad crop had survived the builders. Once they are finally gone (soon I hope) I will replant and hope for a productive late summer. I’m so sad not to have any courgettes this year. STILL waiting for the final piece of glass for the limery… not impressed with the company who are supplying it. The electrician can’t finish until the glaziers are done so we have ground to a halt… sigh. It’s always the glass! Just about every project that has to wait is due to glassworks. I am really hoping they come today… this serenity lark is wearing thin and I can feel myself working up to getting cross, which is not good. I was hoping to take up gardening to reduce my stress, but that relies on the builders finally leaving… no, sod it, I’m just going to fill the limery with stuff and they will have to work round it! So true… I know that we will eat every potato we grow and every tomato, pepper and lettuce… not so much though with the oca and kohlrabi! The rat ate every oca tuber that I had so no oca for me and I haven’t even tried growing kohlrabi as I don’t like the taste. I thought about your battle with wildlife the other day when an ecologist friend of mine reported that she had been radio-tracking quolls in the Flinders Range… someone loves them! 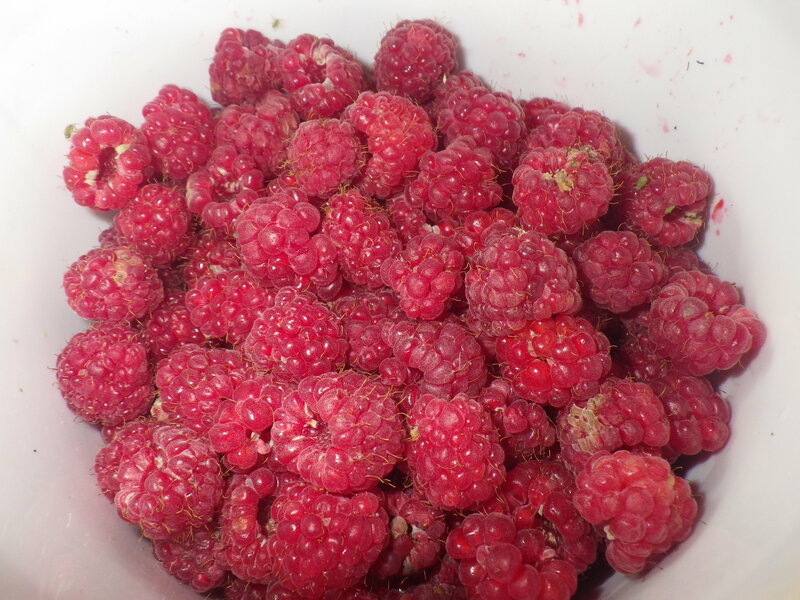 Already the health benefits of this harvest are clear – I had some of those raspberries in raspberry liqueur for an aperitif yesterday and immediately felt healthier. They should be on prescription (the aperitifs. Oh, all right, and the raspberries). Just harvested about 4 pounds of goosgogs and the same of Black currents. I haven’t harvested anything today because it’s been so wet… which means the raspberries will be twice the size tomorrow! Mustn’t grumble – they will be so welcome come the winter. How quickly the garden goes back to being wild and how hard it is to keep it under control. Your raspberrries and currants look so lovely. Do you like summer pudding? You have just reminded me how very much I do and think I will have to make one now! I had wondered how the building was coming along…it will all be so worth it when it is all done. I like summer pudding, but Mr Snail is not so keen. He was, however, delighted with the red currant and white chocolate muffins! What a breakfast you must have had! Lovely! Matt and I were delighted to discover that the fruit plants in his garden were happily producing away. Prompting a very yummy red & blackcurrant, raspberry and gooseberry mix, with yoghurt. Nom nom! Ooh, lovely… so nice to find they can take care of themselves! Indeed. And we’ve now planted some vegetables too. Will be reading your posts with even more attention now to try and learn a bit about gardening! All my chillies and peppers are miles behind because they have had to live outside while construction was underway. I’m hoping they catch up now they are in the (still unfinished) limery.